As I said in my Easter|Spring Coloring Pages post, Easter is one of my favorite holidays. Unlike the foods of Thanksgiving or Christmas, Easter treats scream “spring” with their pretty pastel colors. Similar to the tulips and daffodils of Spring, Easter candies are bright, colorful, and varied. 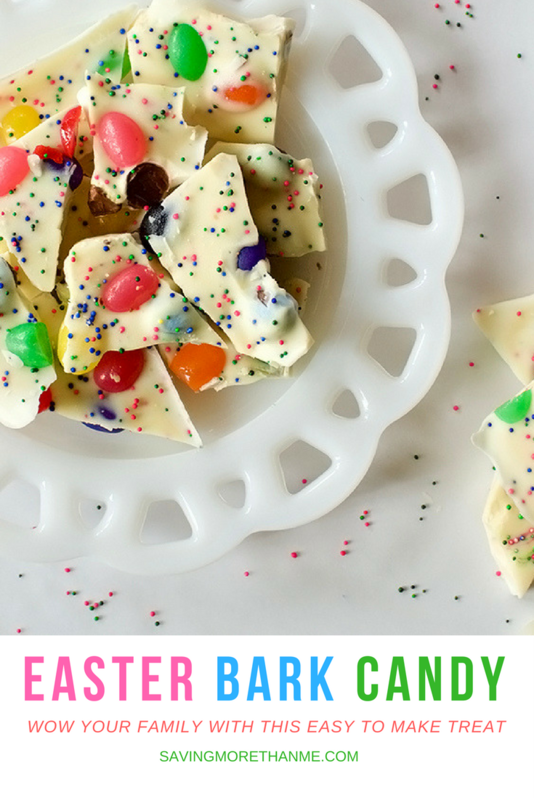 As we say goodbye to winter whites and browns, it’s time to celebrate with this colorful Easter Bark Candy. Not only is it easy to make but it’s oh so tasty and just plain pretty. With a few minutes of effort, your family will think you spent hours making this fanciful treat. If you plan on making this treat, I highly recommend that you use quality chocolate and candies. It just doesn’t taste the same when you use cheap chocolate or candies so try to buy a quality brand. Line a cookie sheet or 8 x 8 brownie pan with parchment paper. Set aside. Note: If you like your candy bark a little thicker like I do, use the brownie pan. If you like a thin bark, use the cookie sheet. Pour the 10 oz white chocolate wafers into a microwave safe bowl. Heat for 15 seconds and then stir with a spoon. Repeat this process until all of the wafers are melted. As soon as the chocolate is melted, pour into your pan–spreading the chocolate equally. 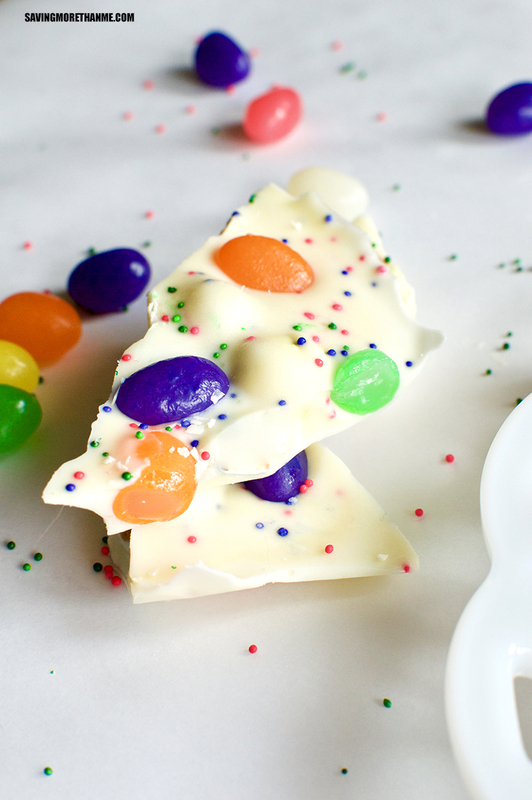 Add jelly beans and mini chocolate eggs to the white chocolate. Break up the 4 oz baking bar into a microwave safe bowl. Heat for 15 seconds and then stir with a spoon. Repeat this process until the chocolate is melted. 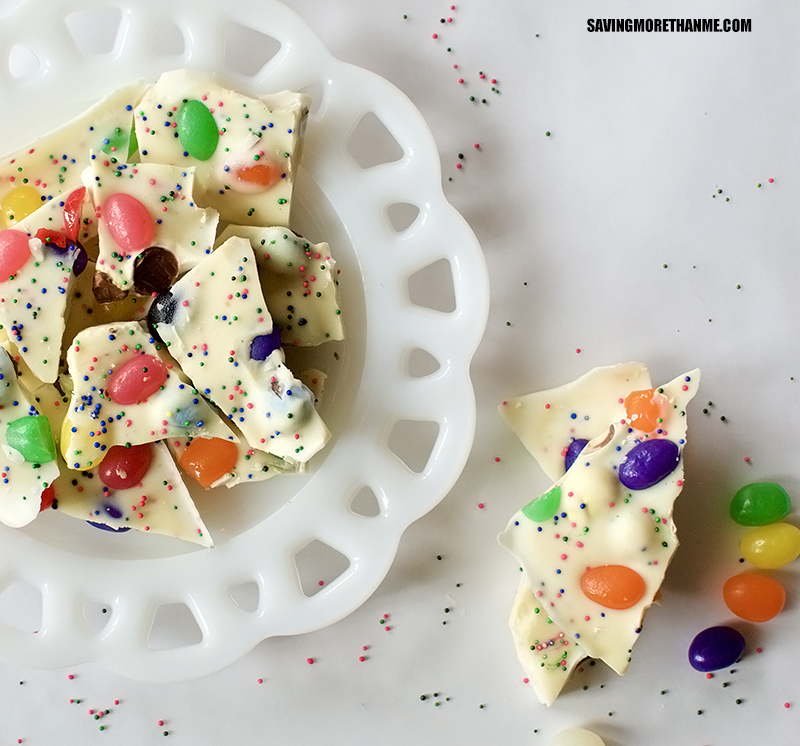 Pour over the first layer of white chocolate|jelly beans|mini chocolate eggs. Sprinkle the nonpareils on top before the chocolate sets. Refrigerate for 3-4 hours (or until solid and firm). Remove the candy from the cookie sheet/brownie pan by lifting the sides of the parchment paper. 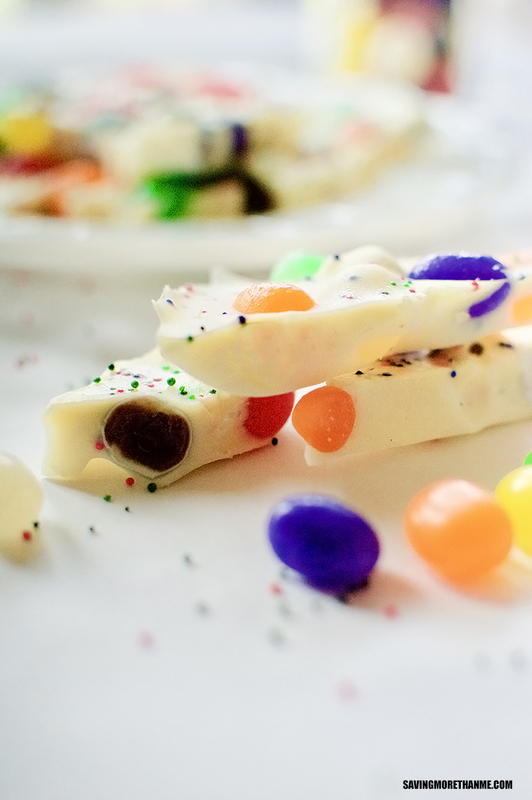 Use a sharp knife and cut the candy into pieces. Congratulations! 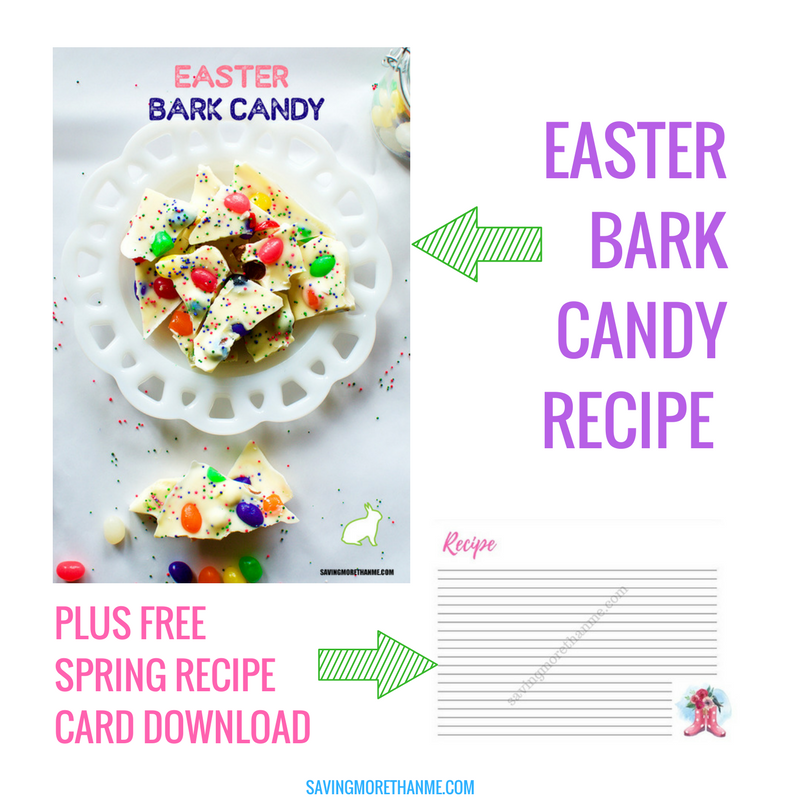 You now have Easter Bark Candy! ***Keep reading because you can download a copy of this recipe below. That was easy, wasn’t it? Easy recipes are the only kind of recipe I like. Ain’t nobody got time for 2-hours-of-prep-time-recipes. Just sayin’! If you’ve made it this far, how about I sweeten this post with a cute recipe card? Your downloaded copy WILL NOT have a watermark on it but it will have those cute rain boots! If you enjoyed this post, won’t you give us a share on social media? We’re so sending you virtual hugs if you do! This looks delicious, and it’s so pretty!! I love the pastel colored mini Cadbury eggs, they’re my favorites & they’re only available at Easter. Happy Easter!